For more than 100 years, the cloistered Holy Spirit Adoration Sisters have shared a contemplative life, sustaining a perpetual, prayer-filled vigil at Philadelphia’s Chapel of Divine Love. The sisters are instantly recognisable for their eye-catching rose-hued habits, a joyous symbol of their closeness to the Holy Spirit. 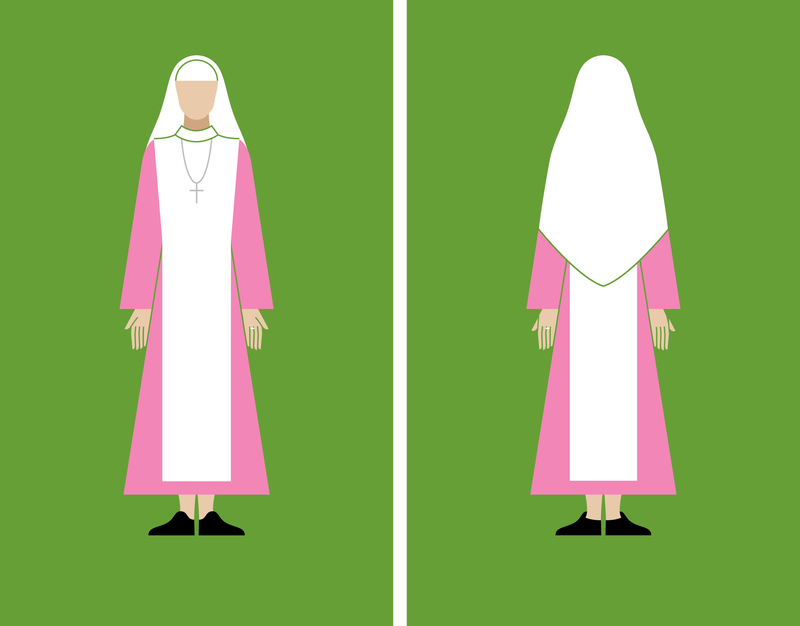 Affectionately known as the ‘pink sisters’, the Pennsylvania-based faction is just one of over 40 Catholic communities of nuns and sisters featured in Looking Good: A visual guide to the nun’s habit. 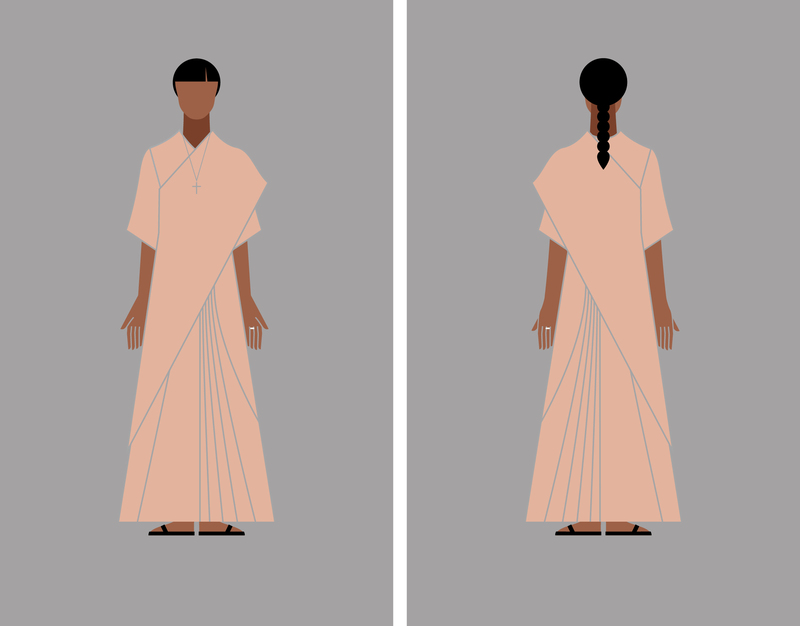 A collaboration between publishing house GraphicDesign&, theologian Veronica Bennett and illustrator Ryan Todd, the book charts religious clothing around the world, decoding its components, significance and distinguishing identifiers. GD& was established by graphic designer Lucienne Roberts and design educator Rebecca Wright with the aim of exploring ‘how graphic design connects with all other subjects’, often taking on projects considered too niche, eccentric or risky for mainstream publishers. They’ve previously tackled mathematics, literature and social sciences, but the duo’s latest title is perhaps their most weird, wonderful, and personal. Although rooted in personal experiences, GD&’s projects are also bolstered by fascinating creative partnerships – in this case, Veronica Bennett, a graduate of Kings College Cambridge where she specialised in the psychology of religion. Bennett trawled through learned texts and dedicated online forums, teasing out unusual and powerful stories during her research. 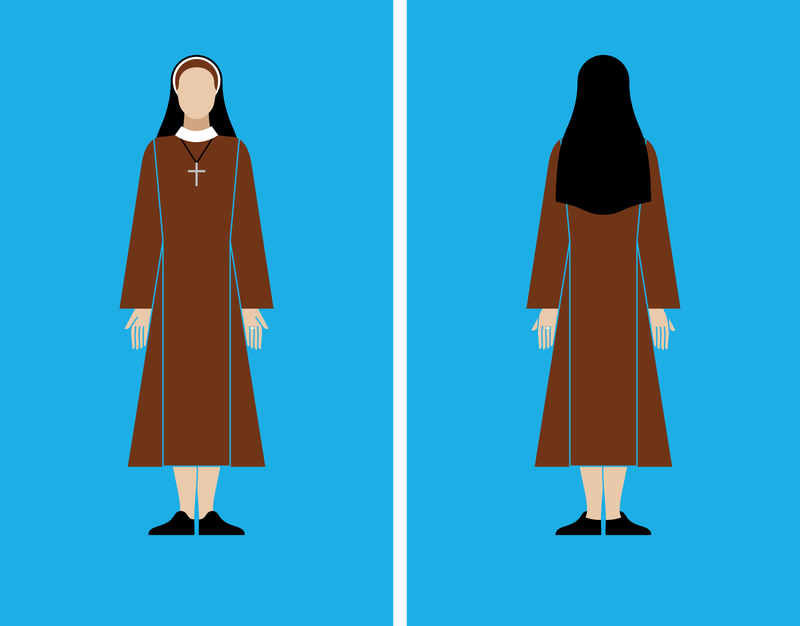 Looking Good, too, reveals the surprising breadth of nun’s habits. Roberts notes that the research revealed two paralleling philosophies. The first is the communities hiding in plain sight, such as the denim-toting Little Sisters of Jesus who blend in with the local community. So, what role does graphic design play in religion? ‘Religious communities have been using colour, form and symbol to communicate their identity for hundreds of years, making the habit a form of visual code,’ Roberts explains. It is London-based artist and designer Ryan Todd’s minimalist illustrations – inspired by Otl Aicher’s depiction of Franciscan monk Wilhelm von Ockham – that bring a fresh contemporary relevance to centuries-old fashion. Part of Todd’s brief was that his images reference the visual language of information design. ‘We cited the apparent simplicity of Otto and Marie Neurath’s Isotype system as an inspiration while my studio [LucienneRoberts+] developed page layouts and typographic devices in a similar vein,’ she says. To wit, the striking illustrations are accompanied by clever signage and thoughtfully compiled facts including each institution’s ethos, charisma, global reach and interesting asides. Recalling Dmitri Mendeleev’s periodic table, black boxes highlight unique details of the various habits; cloistered nuns are slyly identified, always first shown facing away; and a colour-coded system groups communities that share a spiritual heritage. 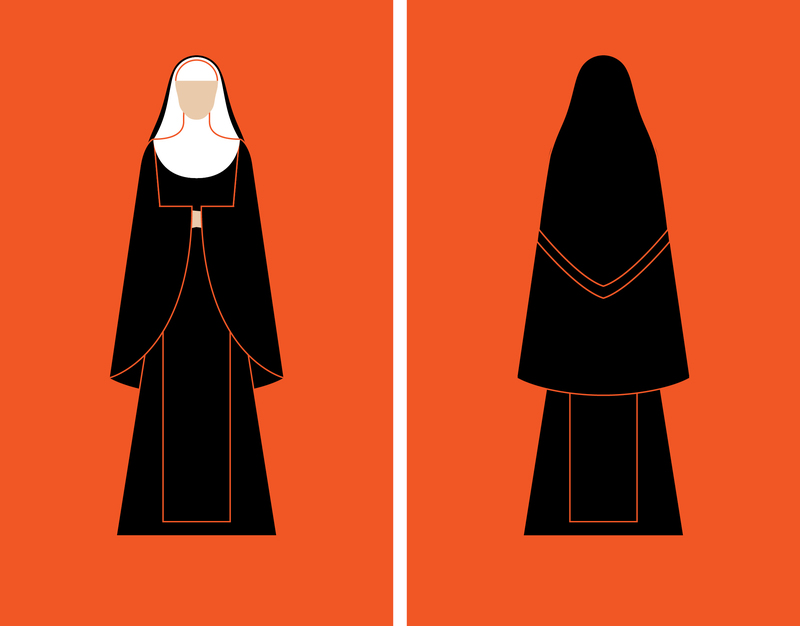 Nuns have long occupied a special place in popular consciousness, from Mother Teresa and nun/artist Corita Kent (the book is dedicated to her) to Julie Andrews in The Sound of Music and Whoopi Goldberg’s gospel-belting Sister Mary Clarence. But as women’s religious attire comes under increasing scrutiny the book feels especially timely. ‘There’s something fascinating about seeing the habit through new eyes,’ says Roberts. ‘When presented in a de-personalised way, as Ryan’s illustrations so elegantly achieve, the habit is revealed to be minimal and androgynous. From a fashion perspective it has a simplicity that is both current and ingenious.’ Amen to that!